I like the balance of serious panels with those that give me great bar stories to tell. Arrival at the Convention Center on Friday is usually the last of the “peaceful” moments of the Con. By Friday afternoon the place will be a sea of people in and outside the Center. The program schedule gets a little more dicey. I have a Plan B for most panels and I’m looking for good stories above everything else. This panel was somewhere down around a Plan D. I was trying to go see a silly Atom Ant presentation that was filled because of an Avatar presentation. While walking to another choice, I found this panel to be completely open. It’s funny how a panel on video game toys might fill a room but the #1 Comedy on television has an opening just as it starts. Truthfully, I’ve seen about one full episode ever of this show. But I’m familiar with what happens on the program and I know the cast. I’m aware there was an ending to the last season that divided the fans. The crowd here told me that all is forgiven with the writers. The fandom seems excited for a show going into its Ninth Season. As far as panels with writers, it was pretty similar to others I have attended in that they give away some simple secrets about the beginning of the next season (we will address the Ring issue) but not many other details. Kunal Nayyar who plays Raj was the host and I found him very charming. I don’t remember him being nearly as appealing in the clips I’ve seen of the show. He was later joined by Mayim Bialik who plays Amy. Once again, the crowd was very excited by the pair. Their chemistry was amazing as it probably is for actors who have practically worked a decade together. The highlight of the panel was Mayim and Kunal reading a made-up “fan fiction”. I can see the appeal of the show and I’m happy to be amongst happy fans even if I don’t know their show. With the runaway success of Constantine . . . is how I would have liked to have started this paragraph on the upcoming Midseason Fox show. The dark turn in current TV shows includes Damien and Lucifer for this coming season. This show is loosely, and I repeat, loosely based on the Neil Gaiman and Sam Keith characters from the Sandman Universe. Lucifer Morningstar is played by Tom Ellis – a vaguely familiar Welsh actor who is very charming here. 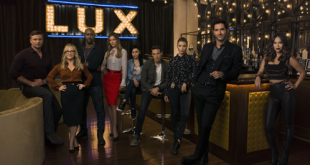 The crux of the show is that Lucifer is living in Los Angeles (the City of Angels – I get it!) where he runs a confusing bar named Lux. He meets up with LAPD detective Chloe Dancer played by Lauren German. The show is slick. That’s the best thing I can say right now after watching the first episode. Don’t even assume you will recognize these in any way as characters from the Sandman series. The show is what I hate most about current TV. It’s an amalgam of what executives think people like in about five other shows. There is the outsider solving crimes as in Elementary with the supernatural elements of both iZombie and Supernatural, and the overproduced music and editing of every CBS crime drama since CSI. I don’t predict success for this show because I don’t understand the long term arc of the show. Lucifer has all the power and Chloe doesn’t seem to bring anything to the partnership. She doesn’t even seem like a great detective. And even worse, I don’t feel any chemistry between the two. Not even in the “Mulder and Scully friendship” chemistry way. I’m not impressed with the characters. I might be being too harsh because they are naming it after a comic that needs a proper adaptation. The worst part is that I don’t think the writers even get the sense of humor of the comic. That said – the crowd seemed very enthralled with Tom Ellis as Lucifer. He got laughs at every one-liner. I left shaking my head because maybe I’m just not the target audience for this show. I’m a different monster than many of the folks at the Comic-Con. I love comics and movies and television shows. But I love science and theoretical criticism too. “Cracking Peanuts” is probably the closest thing to a college lecture at the Con. In fact it was two lectures. Stephen Lind from Washington and Lee University spoke the first half on religion in Peanuts comic strips. John Auxier from Trinity Western University lectured on distressed couple communication patterns. I love this comic strip so much that it’s natural to want to go deeper. Stephen Lind has a Charlie Brown Religion book coming out in the Fall. Charles Schulz inserted bible verses and references into his work on average 10-14 times a year. That’s more than Red Baron appearances and Charlie Brown kicking the football. But what’s more interesting is the way he raised theological questions without being so obvious. The strip below shows how in three panels he can simply address world population control but at the same time look at deeper religious implications. This isn’t preaching it’s thought provoking and that’s exactly what I want in my art. I was even more taken by John Auxier’s talk about Schulz and distressed couple communication. There’s a difference between an autobiography, a diary, and a blog. Peanuts was not an autobiography and in many ways it wasn’t a blog. It functions mainly as a diary. There are coded messages and while Schulz’s wife is likely Lucy, Charles is facets of most of the other characters. I was excited to see one of my favorite strips used as an illustration. In 1972, Charles was separated from his wife and kids for the first time. His fears about his children came through in one of the most touching strips ever. I don’t know of a better description of that feeling of comfort and security as sleeping in the backseat of the car as your parents drive home at night. I enjoy it now as a parent when my kids sleep. And the parents do all the worrying for you. But then it ends. Suddenly it’s over. You never get that again. Never. Schulz is communicating his fears about his own children. I’m sending my second of three children off to college and this feeling haunts me too. The discussion led to the relationship between Lucy and Schroeder. After viewing a few strips you ask yourself, who do you feel sorry for the most. And inevitably, people will think and say both of the characters. It’s a testament to Schulz and the way he viewed his relationships. There are two types of reactions to stress in life – fight or flight. Lucy wants to talk and she wants attention and she is the embodiment of the fight response. In most of the strips, Schroeder is wordless and has his head down. His response to stress is a form of flight. He concentrates on his art to the exclusion of her needs. It’s a brilliant illustration of the communication breakdowns in marriages. I left this panel excited and needing to take a small break to just let the larger issues sink into my brain It may even lead to a reread of the books with these ideas in mind. The work keeps giving in my life. MORE GREATEST MOVIES NEVER MADE: THE SEQUEL! I didn’t get into the Lost In Space reunion panel and used the time to clear my head with some fresh air. That led me back to what was one of my favorite panels last year. I have always loved reading or hearing stories about scripts that have never been filmed, partially filmed or just never seen the light of day. Who doesn’t love a good “What If?” story. There is a new documentary that was made available at Comic-Con about the Tim Burton Superman film in 1998. The documentary by Jon Schnepp is called The Death of ‘Superman Lives’: What Happened?. This version with Nicholas Cage as Superman was alternately called Superman Reborn. The costumes and design put it squarely in the Tim Burton Universe and I think it would have been a take on the character that we haven’t seen put on film ever before. There were many hit-and-miss discussions that probably all deserved more attention. I’m interested in the Indiana Jones film called Saucer Men From Mars with a Frank Darabont script. They say it would have been better than Crystal Skull but I’m not sure that is saying much. There was another Frank Darabont script floating around for a Buckaroo Banzai TV show. And George Lucas had ideas for a TV show that would have ended up being feature-film pricing for almost every episode. Speaking of TV, there’s a a script for a Deadwood film that will probably never happen at this point. Last year, the discussion centered around Jodorowsky’s Dune. His was not the only version of Dune that was almost put to film. Ridley Scott was going to do Dune as his answer to Star Wars until a death in his family caused him to take a break in filmmaking that led to him coming back to make Blade Runner. In a similar vein, the different versions of Neuromancer were discussed. I’m less fascinated here since the book has yet to yield a decent version. This is fun for me. I like the balance of serious panels with these that give me great bar stories to tell. I can’t believe I’m going to admit this on a public forum. Two of my favorite new shows of the past year are from The CW. I really enjoyed the way that The Flash went about telling a superhero story. But I was most surprised by the clever fun of iZombie. This panel with the full cast and executive producers Rob Thomas and Diane Ruggiero-Wright was one that I was curious to see. I know the way these panels go for new shows. There was a short first season that had some success and now the writers and producers are scrambling to put together a full second season. There weren’t many details beyond the first few episodes including that the show will be back on air October 6th. We know that Liv (the beautiful Rose McIver) will be in the first three episodes – a grumpy old man, a frat bro, and a Real Housewife of Seattle. The cast was very lively and seemed to be having a great time. As they should for being on a new hit show. I was most taken by David Anders who as Blaine isn’t always lovable on the show but has an incredible sense of humor. It’s not going to be a good start to the season for Liv as everyone will be in hate with her. I think that’s a nice change of pace for the show. They don’t have to change the format but it needs to keep evolving the characters or it will quickly stagnate. I was glad to hear and see the cast but glad we didn’t get too much spoiled because the show is a rare gem for me. A show I can watch with the whole family. I’ve talked about tradition and none are bigger than this one. It has to be a full nine or ten years in a row for me to attend these worst cartoons. It just does my heart good to end a busy day with a little Paddy Pelican, and some awful Super President battling some weird vulture people, and marvel at Mighty Mr. Titan. I walk out into the fresh air knowing that this was an excellent day that entertained and made me think. It gave me hope for Saturday.